Pandit Ravi Shankar needs no introduction! The sitar maestro whose 94th birth anniversary falls today was known to all as the ‘godfather of world music’. Raaga.com pays tribute to this gem today. RaviShankar acknowledged as the global ambassador of Indian classical music, learned sitar from his guru Allaudin Khan. Thanks to the wonderful training, Ravi Shankar soon became the music director of the All India Radio, New Delhi radio station. During his tenure, he composed various pieces merging classical and western instrumentation. RaviShankar was also known for his distinct style of music. His concert pattern infact influenced many of his contemporaries too. His performances always began with a solo alap, jor, and jhala (introduction and performances with pulse and rapid pulse) influenced by the slow and serious dhrupad genre, followed by a section with tabla accompaniment featuring compositions associated with the prevalent khyal style. He often closed his performances with a piece inspired by the light-classical thumri genre. Ravishankar is the reason behind the creation of now popular raagams – ‘Nat Bhairavi’ ,’Purvi kalyan’ , ‘Aahir Lalit’ ‘Charu kauns’. Such is the brilliance of music imbibed in him! 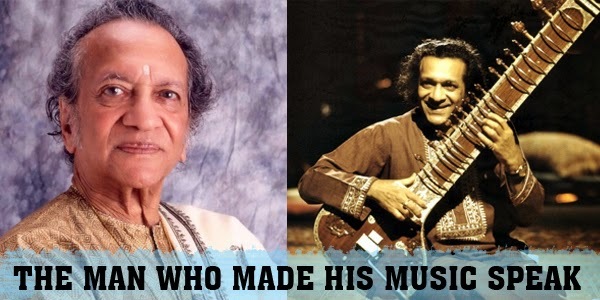 One can say it was Ravishankar who took Hindustani Music to a global level. Not many know that Ravi Shankar bagged the prestigious Oscar nomination for his score in the film Gandhi by Richard Attenborough. The documentary on Pandit Ravi Shankar titled ‘Raga’ and shot by Howard Worth was released in 1971; which ofcourse is worth a watch. The man whose records can never be re-written, he remains immortal and his music never fails to melt our hearts. Happy Birthday to the new daddy in town!